"Burlington pizza with Italian flavour." An incredible crust and sauce that are made daily in-store. Handcrafted and topped with the freshest ingredients. Our new Beef Brisket Pizza is marinated in our own spice for two days and slow cooked in the oven for 10 hours. Sautéed Onions, Sautéed Cremini Mushrooms, Creamed Horse Radish, Mozzarella and Swiss Cheese, Parsley. Our new pizza has a name! It tells a story in which the birds of the World gathered and decided to go on a quest to find their spiritual king (simorgh), a Persian mythical bird similar to the Phoenix. Each bird represents a human fault which prevent man from attaining enlightment. One by one they drop out of the journey. In the end, only thirty (si_in Persian) bird (morgh - in Persian) make it to the end. There they find that they themselves collectively become the great simorgh. 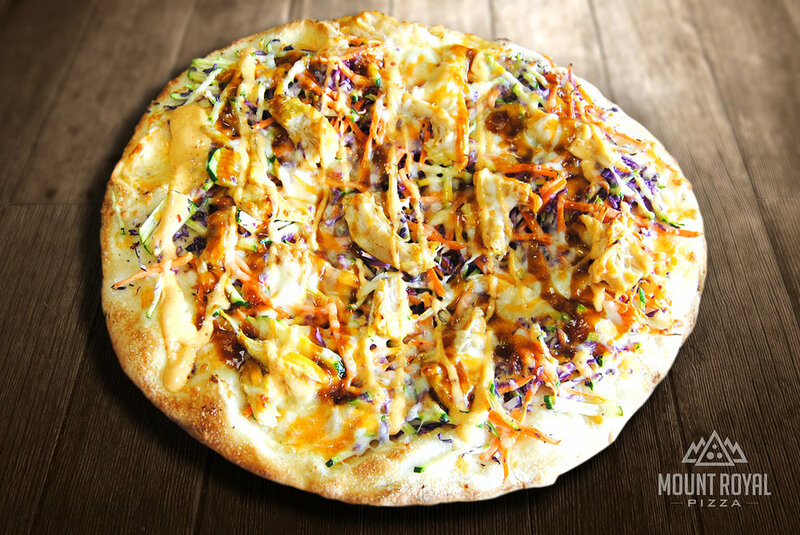 Thin Crust, Teriyaki Chicken, Zucchini, Red Cabbage, Carrot, a blend of cheddar, Monterrey Jack and Mozzarella Cheese. Sriracha and Sweet Thai Sauce. No sugar is added to the dough. We use Extra Virgin Olive Oil. Beef Brisket marinated in our own spice for two days and slow cooked in the oven for 10 hours. Sautéed Onions, Sautéed Cremini Mushrooms, Creamed Horse Radish, Mozzarella and Swiss Cheese, Parsley. Bocconcini Cheese, Cherry Tomatoes, Extra Virgin Olive Oil, fresh Basil and Parmigiano Cheese. Olive Oil and Garlic Topped with Diced Tomatoes Marinated in Pesto Sauce, Feta and Mozzarella, Cheese, Onions and Fresh Herbs. Ricotta and Feta Cheeses, Fresh Baby Spinach, Red Onions and Tomatoes, drizzled with Olive Oil, Sea Salt and Garlic. Cherry Tomatoes, Bocconcini Cheese, Smoked Prosciutto and Aged Parmigiano Cheese. Creamy Garlic Ricotta Cheese, Fresh Arugula and Barberries (a tangy-sweet lemony berry), and Pomegranate Balsamic reduction topped with Parmigiano Cheese. Ricotta, Mozzarella, Parmigiano and Gorgonzola Cheeses..
Creamy Garlic Goat Cheese, Baked Potatoes and a blend of Monterey Jack and Cheddar Cheeses, Crispy Bacon and Fried Onion. Roasted (Eggplant, Garlic, Tomatoes and Red Peppers), Onions and Mozzarella Cheese. Pepperoni, Mushroom and Real Bacon. BBQ Chicken, Red Onions and Roasted Peppers. Topped with Monterrey Jack & Cheddar Cheese. Grilled Pesto Chicken, Sundried Tomatoes, Red Onions and Mushrooms. Pepperoni, Mushrooms, Green Peppers, Bacon, Red Onions and Tomatoes. Mushrooms, Green Peppers, Tomatoes, Red Onions and Olives (Green or Black). Pepperoni, Bacon, Ham and Sausage. Artichoke Hearts, Black Olives, Red Onions and Tomatoes. Topped with fresh Garlic. Jalapeno Peppers, Ground Beef, Red Onions, Black Olives and Diced Tomatoes. Sundried Tomatoes, Red Onions, fresh Garlic and Roasted Zucchini. Topped with Feta Cheese. Mild & Hot Italian Sausage, Red Onions and Roasted Red Peppers. Meats: Pepperoni, Bacon Strips, Bacon Topping, Mild/Hot Sausage, Ham, Ground Beef, Anchovies. Veggie: Mushrooms, Red Onions, Tomatoes, Green Peppers, Roasted Red Peppers, Green/Black Olives, Pineapple, Hot Peppers, Jalapeño Peppers, Garlic, Fresh Basil, Zucchini, Spinach, Broccoli. Gourmet: Chicken, Prosciutto, Artichoke, Arugula, Parmigiano Cheese, Ricotta Cheese, Goat Cheese, Gorgonzola Cheese, Bocconcini Cheese, Monterrey Jack Cheddar, Caramelized Onions, Sundried Tomatoes. 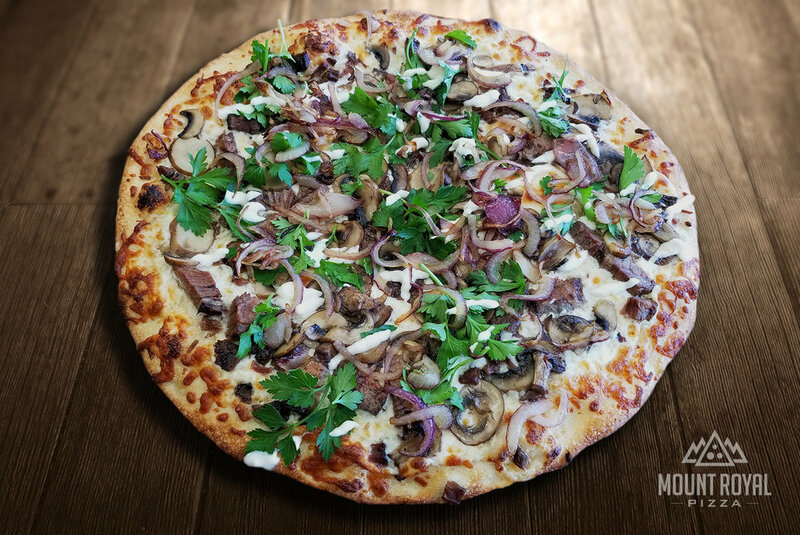 Mount Royal is not only the best pizza in Burlington. Bocconcini Cheese, Arugula, Cucumber, Cherry Tomato, Lime and Olive Oil. Beets, Boiled Egg, Baby Spinach, Goat Cheese, Sriracha Thai Dressing. All Sandwiches on our Ciabatta or Pita bread is made fresh daily in-store. Let us know what you think. We would love to hear any feedback that you would like to share.